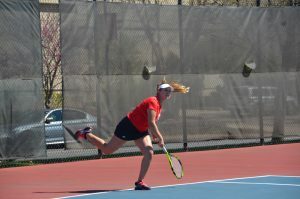 The women’s tennis team could not find its stride last weekend dropping back-to-back matches against the Drake Bulldogs and the Northern Iowa Panthers. 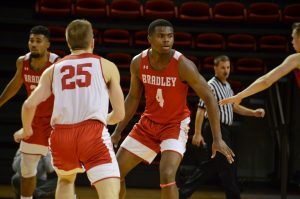 On Friday, the Braves matched up against Drake and could not gain a victory. Coach Scott Peterson said he thought the girls still played well regardless of what the statistics show. The Bulldogs jumped to an early lead winning all three doubles matches and continued their onslaught by gaining wins at all single positions. Sophomore Nicole Miller lost by a score of 6-0, 6-2 at the No. 1 singles position against Veronika Leszayova while freshman Veronika Wojakowska lost to Gabriela Demos at the No. 2 position. Drake’s Jessica Labarte and Jessica Aguilera defeated juniors Emily Regenold and Kelly Donohue at the No. 3 and 4 singles positions, respectively. Junior Jessica Buterbaugh and senior Erin Krubeck also fell at the No. 5 and 6 singles. On Saturday, the Braves faced off against the UNI Panthers where Regenold and Miller earned their 16th win together this year with an 8-6 victory over Sampada Kanade and Diana Mendez at No. 1 doubles position. The Braves could not feed off their energy eventually losing the doubles point along with the six singles points. The Panthers did not drop a single set and cruised through their matches against the Braves. Miller lost her singles match against Phoebe Walker with score 6-2, 6-4, while Laia Gonzalez-Garrido stopped Wojakowska at No. 2 with scores of 6-2, 6-3. Regenold and Donohue lost their matches at the No. 3 and 4 positions along with Krubeck and Braun who lost at Nos. 5 and 6. Peterson said there is some work to do before the team’s next match. 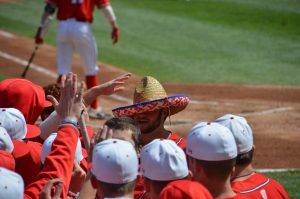 The Braves resume play at 1 p.m. today at Evansville.